Look up, and appreciate a beautiful skyline matched by very few town’s of Paisley’s size. 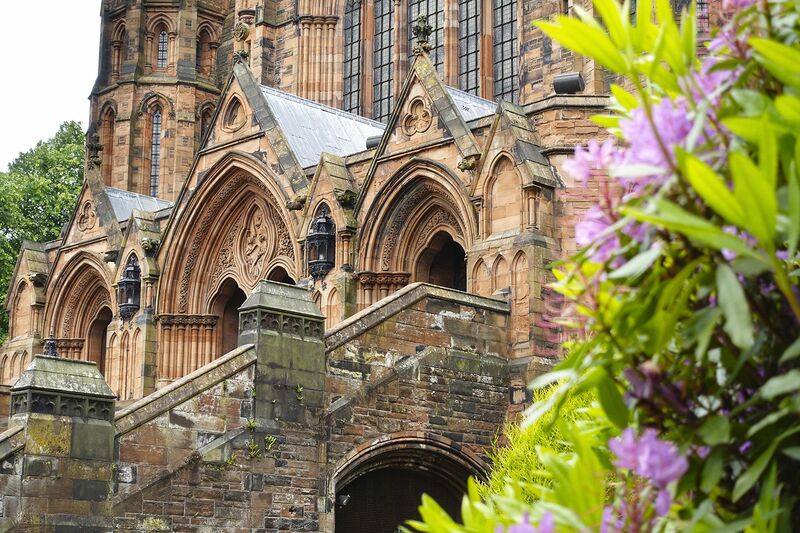 The 850-year-old Paisley Abbey is the town’s most famous landmark, but architectural gems abound. The legacy of the Coats and Clarks threadmaking dynasties can be seen in many of the town’s buildings, including the Town Hall, Coats Observatory and the Paisley Museum and Art Galleries. Look out for former mill buildings, statues and monuments as you walk around town. From Renfrewshire House, walk towards Paisley Abbey. Built in the 12th Century, Paisley Abbey is the jewel in Paisley’s crown. See if you can spot the gargoyle modelled by a modern stonemason on a monster from the film Alien. Located at the highest point on Paisley’s townscape sits Oakshaw Trinity Church. Formerly Paisley’s High Parish Church, legend has it that after a stonemason fell to his death, his workmates carved the outline of his handkerchief and spectacles into the cobbles as a tribute. The Oakshaw area of Paisley is one of the oldest inhabited parts of the town, and is home to a number of incredible listed buildings including; 20 Oakshaw Street, a former Gaelic Church; the former Hutcheson’s Charity School, now Oakshaw Trinity Church Halls; the Peter Brough Home for Nurses with its impressive turrets; and many fine tenement buildings. The ornate stonework around the entrance to Coats Observatory is well worth a look. Scotland’s oldest public observatory makes for another stunning addition to the Paisley skyline. The John Neilson Institution was bequeathed to the town by its namesake after his death in 1839. Designed by Charles Wilson, it opened its doors as a school from 1852 until 1968. For a brief time it became Oakshaw High School, until it too closed in the 1970s. It was converted into apartments in the 1990s. Take a break on the corner of High Street and Lady Lane to read the plaque and learn the famous story of the Slug in a Bottle. This was the site of Minghella’s café, where a horrified May Donaghue found a slug in her bottle of ginger beer—and so began a legal case that changed consumer rights around the world. The majestic neo-Gothic Thomas Coats Memorial Baptist Church was initially budgeted at £20,000, but by the time it was completed in 1894, costs had soared to £110,000—over £6m in today’s money. When you see it though we think you’ll agree it’s worth every penny! Paisley Museum and Art Galleries were gifted to the town by Sir Peter Coats in 1871 and designed by Glasgow architect John Honeyman. A £42m project will transform the museum complex into an international class destination by 2022. Designed by architect James Donald, Dunn Square was gifted to the town by William Dunn, MP for Paisley, in 1894. It reflects the architectural style of the Town Hall, and features a number of statues, including Thomas Coats, Sir Peter Coats and Queen Victoria—famously with her back turned to the town. From Dunn Square, follow the River Cart back to Renfrewshire House.